A properly functioning drainage system is essential if any home has to be liveable, and often a blocked drain can make the home unliveable. If only the kitchen sink or washbasin has a blocked drain the problem can be managed, but if the bathroom or toilet has a blocked drain, it will be impossible to live in the house, as the water will flood the rest of the house, damaging goods and making it difficult to do any activity. The problem will be particularly severe if there are small children in the house, whose health could be adversely affected by the blocked drain. The method used to unblock the blocked drain depends to a large extent on the cause of the blockage. If the blockage is due to dirt in which has accumulated on top of the drain cover, it will be relatively easy to remove the dirt. On the other hand, if the dirt causing the blocked drain has accumulated within the drain pipes which are not accessible, it will be far more difficult to remove the dirt, or unclog the blocked drain, so that the dirty water will get drained away quickly. 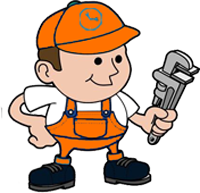 If the problem can be easily solved, anyone residing in the house can remove the dirt, else a specialized plumber may need to be hired. In many cases, especially when there is no hard water , the blocked drain will be caused by dirt which has accumulated on the drain cover or just below it. For example in the kitchen sink, food particles, fruits and vegetables will accumulate over a period of time, causing blocked drains. These can be easily removed by removing the drain cover and manually removing all the accumulated dirt, using a knife or blade. The dirt will be then thrown into a dust bin or disposed off, to prevent it from causing any further damage. A filter may be installed, to prevent the problem in future. The problem of blocked drains in bathrooms may be caused by hair which falls off while bathing. The hair should be periodically removed weekly or twice a month, by removing the drain cover. In case the drainage pipes are blocked, the problem will be far more severe as these pipes can be easily accessed. In some cases, chemical solvent may be used, to dissolve the dirt in the pipe. These highly corrosive chemicals will react with water to form a solution which will remove all the dirt in the pipe.